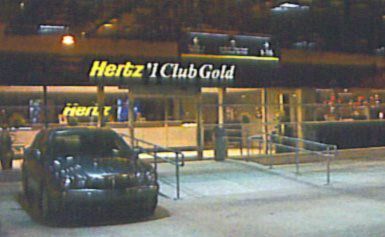 With no natural light available inside the Airport Car Rental Terminal, the Hertz#1 Club Gold building was designing to “glow” all with the extensive use of special lighting and glazing so patrons find it bright, warm, and inviting. 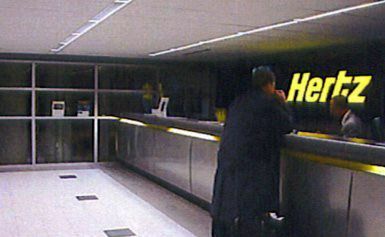 The fully glazed floor to ceiling storefront design with automatic doors, allows complete visibility into the VIP lobby where interior signage, custom counters, and finishes convey the Hertz corporate image. The building was engineered and constructed of steel. The overall building height had to be kept to a maximum of 10’ 6” in order to roll the building sections trough overhead doors and into position inside of the large parking garage. In order to give the building the appearance of greater elevation, parapet sections were built at the planet and installed on site. These also served to conceal the HVAC equipment for the facility. Because of the site location and time of year, a pre-built modular frame was a perfect solution. The entire steel and concrete frame of this building, including roofing, exterior sheathing, insulation, and wind barrier was completed at the plant, and shipped once the foundations were complete on site. Because of the labor relations in Brooklyn, interior systems and all finishes were completed on site by local trades. 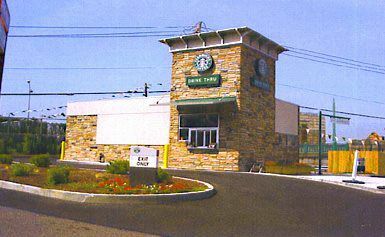 Using a pre-built building frame, all site work could be completed simultaneously to speed the construction schedule—minimizing site construction time and store opening was achieved earlier.